How will tech-driven cities get smarter and more connected? Look to Los Angeles – a city preparing to host the 2028 Olympics, an event that will ultimately impact every aspect of life across the SoCal region. 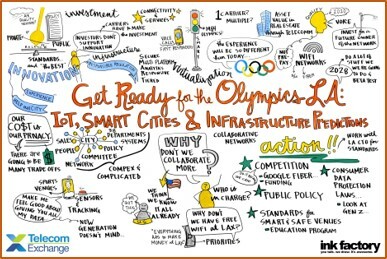 With high-profile global attention, the LA Olympics presents an exceptional opportunity to test the most advanced technologies and connectivity solutions available. 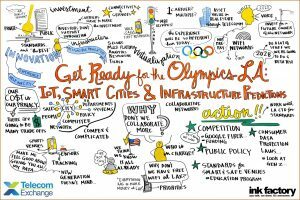 The challenges facing Los Angeles and other prospective smart cities were the focus of the CEO roundtable I moderated at Telecom Exchange (TEX) LA, Get Ready For the Olympics LA: IoT, Smart Cities & Infrastructure Predictions. Offering their expert insight were the following panelists: David Erickson, Founder & CEO of FreeConferenceCall.com & CarrierX; Marc Gittleman, CEO of 5×5 Telecom; Derek Peterson, CTO of Boingo Wireless; and Peter Marx, Former CTO of the City of Los Angeles. What’s distinctive about TEX CEO roundtables is that the panelists and C-level audience engage actively and candidly – and without any recordings or attributions. It works! This format encouraged outstanding discussion and intense debate at our TEX LA session. Key points and action items were documented real-time in the vivid Manifesto image as shown. My outlook on the four areas that were identified for industry action are summarized below. The action items are Public Policy, Competition, Smart & Safe Venues, and Consumer Data Protection. Bottom line: Successful smart cities definitely need innovative network and technology solutions, but also smart public policies, community involvement, collaboration, and industry support. 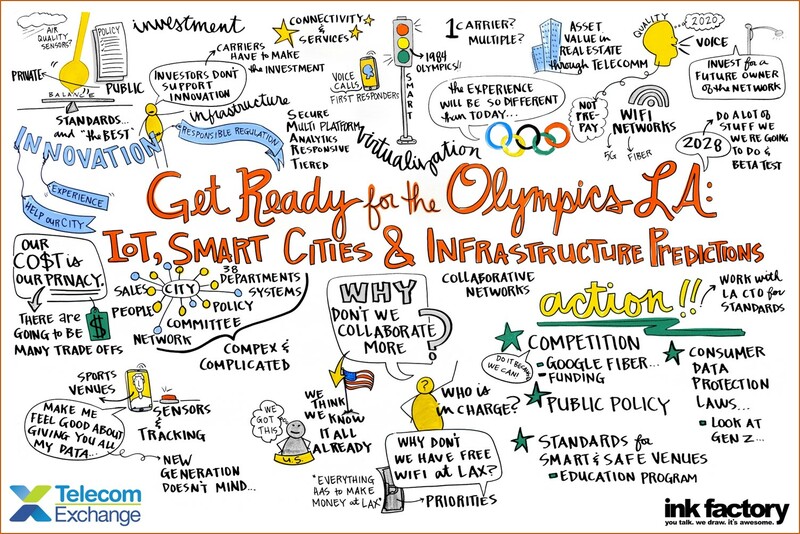 During the next several years, it should be very informative to track how Los Angeles meets the challenges of ensuring a smart and safe experience for its community and the Olympics event. Who will manage the 2028 LA Olympics? At stake are key policies such as the balance of public vs. private investments and the priorities for smart city projects. Los Angeles gained experience with these issues when it hosted the 1984 Olympics. The ‘smart’ transportation plan to ease traffic at that time utilized new video technology, as well as sensors in the streets. However, just as important were changes in regulatory policies to allow off-hours deliveries and staggered work schedules. While the temporary policies ended in 1984, the traffic control system is still operational decades later. It’s about time for IoT! Every major sports venue is investing in next-gen technologies and infrastructure upgrades to improve operations, security systems and the user experience. Open APIs and AI-enabled applications are facilitating the delivery of advanced capabilities and personalized fan services. Overall, the most critical challenge is security. Since existing venues will be used for the 2028 Olympics, collaboration on best practices for smarter and safer venues can get started sooner than later. What are the incentives for network investments? New investments in network infrastructure and connectivity services will be required for the 2028 Olympics. The expectation is that 5G will be ubiquitously deployed, enabling a multitude of innovative public and private IoT applications. Having ample enough fiber access and backbone capacity to support these applications has to be part of the game plan. Considerations for the network and technology providers vying for these opportunities include profitability, network ownership and asset values, technology alliances and public/private partnerships. Where is all my data? A massive amount of personal data already sits in the cloud – and increasingly more will be captured, analyzed and monetized as more things become ‘smarter’. Personal data protection is a complex challenge for the 2028 Olympics. Regulations vary considerably by country, and California has its own strict laws. Nevertheless, technology advances and market forces will likely continue to outpace the effectiveness of government regulations. There is also a clear trend that younger generations tend to be content with exchanging their privacy for free apps and services. For information about how your company can support the Telecom Exchange LA Manifesto, click here.